I think I mentioned before that Frankie is a bit of a bully and that contributes, at least in part, to Puck’s stress and litter box issues. But while Puck may be stressed by Frankie, he is not intimidated by him. Fights happen all the time in our house but the most aggressive and unplayful fights happen between Puck and Frankie. We had a night or two of cold weather last week and Rose had out a small blanket to keep her legs warm. On Friday morning I noticed the blanket was still out so I folded it and placed it on one of the cushions. I thought one of the cats would like to lie on it. I was right. Puck found it to be quite comfortable. That evening, as Rose and I were watching television, Frankie attacked Puck while he was lying on that blanket. There were hissing and screaming and fur flying and yelling (from us humans) and when the dust settled Frankie was in possession of the blanket. But Puck wasn’t done . . . He jumped back up and plopped himself down on the blanket right next to Frankie as if to dare him to try to knock him off again. Chris saw what was going on and added his considerable weight to the blanket issue (and his weight is considerable). In the end, Frankie capitulated and peace was again restored in the land. 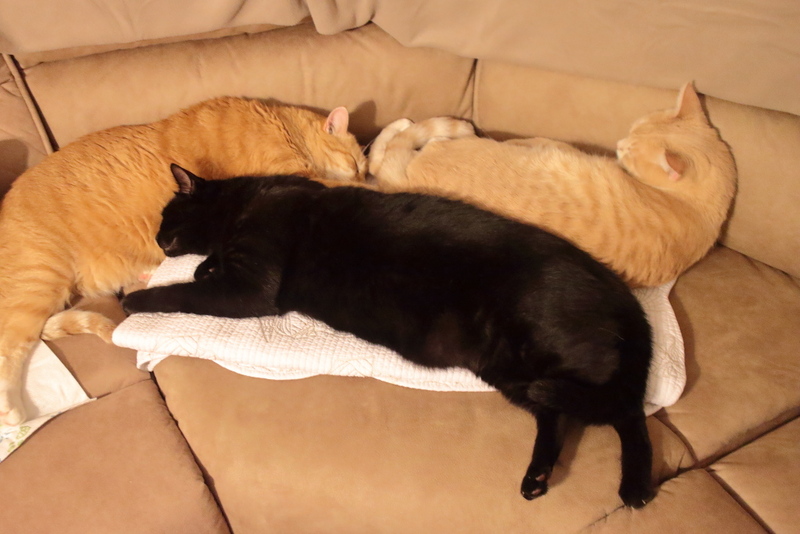 This entry was posted in Uncategorized and tagged blanket, Cats, fight, peace, sofa on November 5, 2017 by Charles Huss. Pingback: Puck Stands His Ground - Baptize A Cat? Hilarious pictures. Looks like you may need a couple more blankets! Sharing is tough. You are right. Everyone needs their own blanket. Whew! More blankets would be nice from a thoughtful human standpoint, but, as you well know, all it would do is spread the bickering to more sites! Anyway, it looks like your kitties worked out a reasonable detente…for now. Rawr! Things always work themselves out until the next time. 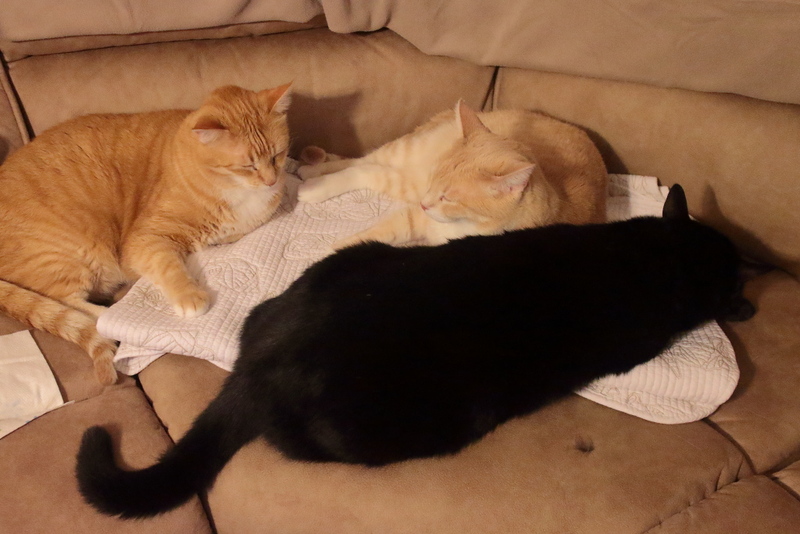 Yay – it’s nice when there ARE peaceful moments – blankets seem to be kitty magnets! Funny how they seem to fight like they hate each other and then will lay next to each other like nothing happened. I think cats don’t hold grudges. Geez, so much drama over a blanket! And in the end everybody got a piece of the real estate. I think they all learned a valuable lesson which I’m sure they will forget soon. Lovely photos, and everybody is happy having a small portion of that blanket. Yes, they all learned how to share. Let’s hope they remember. Sometimes they are more entertaining then what’s on TV!! I think we need a female here to keep the boys in line.